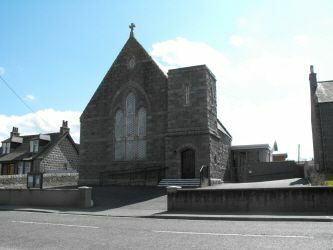 The building used by Howe Trinity Parish Church was built in 1867 as the Alford Free Church of Scotland (later the United Free Church, and following the national reunion of 1929, the East Kirk of Alford). The building was substantially reordered in 2001, and the new hall was added in 2008. Sunday worship is held at 10am, with occasional evening services as advertised. Howe Trinity was formed by the union of Alford, Keig and Tullynessle & Forbes churches in 1999. Alford West Church is now in private hands (for contact details get in touch with the minister on 019755 62282). Keig Kirk is now owned by a local trust, the Friends of Keig Kirk (for access phone 019755 62569); The Old Kirk of Tullynessle is also owned by a local trust (for access phone 019755 62014). Occasional services are held in Keig and Tullynessle as advertised. Alford West, Keig and Tullynessle churches are situated within historic graveyards. The “new” Alford Cemetery is situated in Parkhill Road, off Donside Road. The old kirk of Keig with its kirkyard is situated within the grounds of Castle Forbes. The old Kirk of Forbes with its kirkyard lies beside the river Don, just off the A944, halfway between Bridge of Alford and Mossat. Further information on the premises is available from the book "Churches to Visit in Scotland".